The Lost Temple of Forgotten Evil from Dark Naga Adventures might have a rather generic name, but it actually deals with the PCs coming across of a cult of Hastur (the Cthulhu Mythos deity) and presumably foiling its plans. 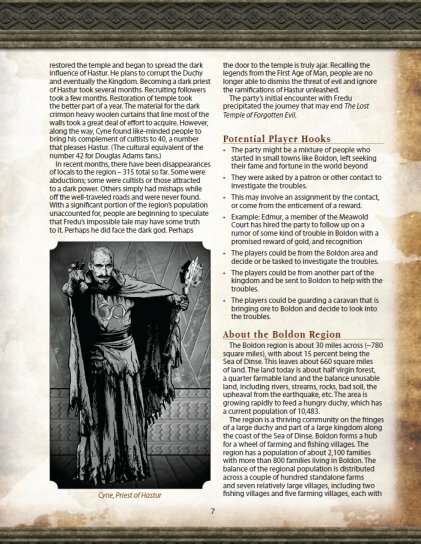 I a big fan of the Cthulhu Mythos (my 2nd favorite RPG is Call of Cthulhu) and incorporate Mythos themes into my own game. Hastur is perhaps the trickiest deity of them all, because it's not entirely clear that Hastur is even a deity in HP Lovecraft's own works. Though he made mention of the name, clearly referencing Robert W. Chambers work, most notable many of the stories mentioned in the King in Yellow. But Chambers work is eerie, surreal, even sensual, perhaps best captured in Karl Wagner's The River of Nights Dreaming. But ignoring all that, August Dereth made Hastur just another squid god, like Cthulhu. Still, here Hastur is more a generic evil god than either. Essentially a local farmer stumbled across a lost temple of Hastur in the woods and when he told his story at the local tavern, no one believed him. Except a local priest, who wanted to destroy the temple. Only once there, he instead became corrupted and converted to the worship of Hastur and does so by recruiting followers, rebuilding the temple, and then starting on a series of human sacrifices. Presumably the PCs will be interested in stopping all this, or perhaps just looting the temple. First they need to find it, which requires them doing some legwork, talking to the drunk and then tracking down some of the information he gave to earlier inquirers that he no longer remembers. This involves trekking to other towns and possibly having encounters on the way. (It's set in a sleepy, framing region, so no outlandish encounters). The temple itself is relatively straight forward. And literally all the encounters inside are just with cultists, no monsters, no weird alien beings, just fairly generic cultists and generic "demons" that aren't really even described, other than generic name. Cult Enforcer and Agent of the Old One. 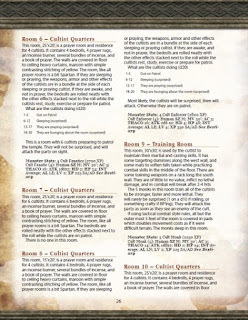 System wise, it's dual statted for 5th edition and a generic sort of OSR. 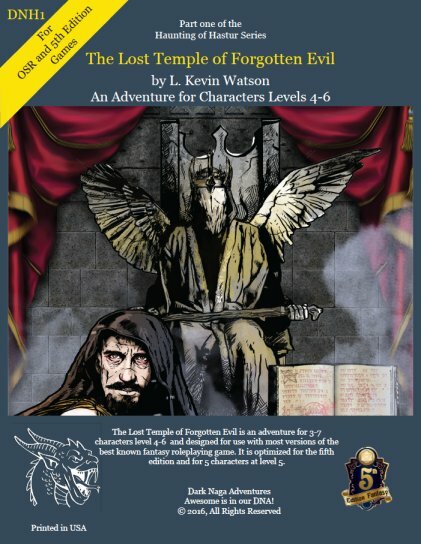 It does make a lot of 5e references, but they can generally be ignored or an OSR alternative is given. 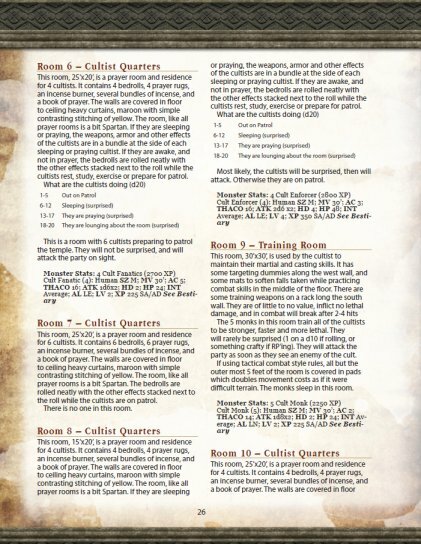 The OSR stats are probably wrong for any game. For instance, almost all the enemies are low to mid level fighters and have multiple attacks for some reason and seemingly max hit points. It's entirely illustrated by Rich Hershey. I have actually bought a couple of his stock art pieces, but truthfully, I find his art style to be among the worst in the RPG industry. It typically features realistic faces (sometimes a bit oversized) painted on a fairly minimalistic background and to me it looks like someone cut and pasted a face from a newspaper on 3rd grader's diarama. On the flip side, the maps by Alyssa Faden of the various villages the PCs might travel to are very nice, old school hand drawn style. Like name itself, The Lost Temple of Forgotten Evil is rather bland for a module dealing with a Cthulhu Mythos Deity, much less Hastur, arguably the most interesting one. 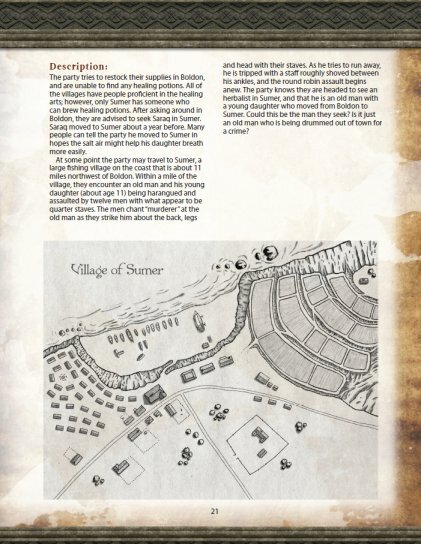 The most interesting parts are the NPCs encountered during the sidequests and many of those are rather glossed over, as are the various villages the PCs visit, which exist only as a name and a map. The temple itself is quite a let down, with no weird stuff. Still, I like the idea of the module and I like how much of the background (of the story and region) is told through sidequests, rather than just a super-lengthy introduction for the GM. I think it makes a decent framework for an adventure, but you'd have to flesh things out and make what details given more interesting.